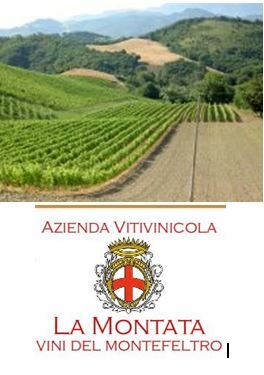 The La Montata estate is located in the Marche region in the northern area of Sant’Angelo in Vado, Pesaro-Urbino, also called the Montefeltro Region and is part of the Massa Trabaria district in the Upper Valley of Metauro. Temperature drift which further enhances the aromas that the vines produce. An important planting for the future is located at about five miles from the town at about 1,400ft. asl. in an area known as Capanne on very favorable land for viticulture with optimal exposure and ventilation. The established and new cépage variety includes white varieties such as Trebbiano Toscano, Biancame, Sauvignon Blanc, Bruni Cross and Sangiovese, Alicante, Aleatico, Montepulciano for the reds. Yet the singular trait of this producer is the preservation of buds from old vines of the area in order to maintain the features of the vines which promote truly outstanding wines. Furthermore, La Montata is one of the only producers in the world that makes a smoked Passito and has been making it as long as the the 15th century and were known as the wine makers of Sant’Angelo in Vado who supplied the Vatican with their Vin Santo, which production from the Vado hills was their favorite. The Vin Santo of Sant’Angelo in Vado is characterized, as sanctioned by secular tradition, by the drying of grapes in large closed rooms with an open fire in order to smoke the grapes. The sweet wine, golden hued, and at times, bordering on amber, delicate and elegant; a wine renown for its singular ability to lead to meditation and elicit unique and pleasurable sensations, with aromas that range from honey to ripe fruit, from blossoms to an amiable smoke aroma.